All opinions expressed in this review are mine and are in no way represent the opinions of the publisher or The Picnic Basket. I guess I am a sucker for good Historical Fiction. Karen Cushman has created a character, Meggy Swann that you must feel sorry for, annoyed at and love all at the same time. Born a cripple in 1573 England, Meggy has more problems than two legs that won't work. Her mother doesn't want her and thrust her upon her grandmother. When her grandmother dies and her father, whom she has never known sends for "his child", her mother is happy to get rid of her. She considers her a curse on her business. 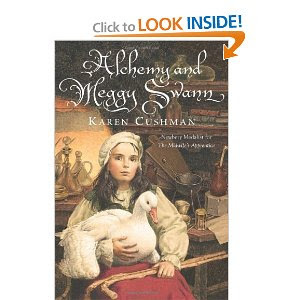 Meggy leaves the countryside along with her only friend a goose named Louise and is dropped at the door to her father's place, an alchemist. When he realizes she is a girl, and crippled he leaves her standing in the door. Like her mother, he also considers her useless. Hungry she soon learns she will have to overcome a lot and transform herself into someone she never knew she could become. She demands her father let her help him and asks questions to try to understand what he is doing. For the first time in her life she has made some friends. Then she finds out her father has a dark side and she must decide what to do about it. Meggy transforms from a despised girl who had to rely on others, to a young lady who finds her real strength. This is an excellent book for those who love the Elizabethan period in history. I will whole-heartedly recommend this book to my students. So much can be done with this book. Students can discuss the sanitation of that time period. They don't realize that things such as throw your food scraps and emptying the chamber pot into a ditch right outside the door caused so much disease. The historical aspects as well as comparing the caring and treatment of people with disabilities back then to today. This was a wonderful book.